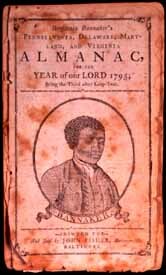 click image for close-up The cover of Benjamin Banneker's 1795 Almanac features a woodcut portrait of the author, scientist, mathematician, farmer, astronomer, publisher and urban planner, at age 64. The unknown artist who created the portrait depicts Banneker in the Quaker garb he always wore, a simple dark jacket and white shirt -- although he was closely affiliated with Quakers, Banneker never became a member of the Religious Society of Friends. The 1795 Almanac was one of six, published annually from 1792 to 1797. In an era when books of any kind were a luxury found in few households, almanacs were common. They included scientific information, such as weather forecasts, tide tables, lunar and solar eclipses, and the times of the rising and setting of the sun and moon; they were also infused with mild poems, proverbs, and other bits of general information. What made Banneker's Almanacs innovative -- aside from the fact that they were produced by a black man in an age when African Americans were considered incapable of scientific, mathematical or literary accomplishment -- was the inclusion of commentaries, literature, and fillers that had a political and humanitarian purpose. In the 1793 edition, Banneker included his correspondence with Thomas Jefferson, in which he challenged Jefferson's ideas, put forth in "Notes on the State of Virginia," about the inferiority of "a race of Beings who have long labored under the abuse and censure of the world." He also included poetry by Phillis Wheatley and English anti-slavery poet William Cowper, as well as anti-slavery speeches and essays from England and America. As bright, as lasting, as your own.